Big changes are coming our way as we open the door to a new chapter in our story. Last week we went to look at a retirement community near us. We enjoyed a delightful visit with friends who live there and ate a delicious lunch in the dining room. After lunch we went to talk to the folks in marketing to find out about getting on a wait list for an apartment. We expected to be told there would be a one or two year wait. As it turned out the exact apartment we wanted had just become available that morning. Did we want it? It has two bedrooms, two bathrooms, a nice kitchen, a big living room and a balcony overlooking the lake. We looked at each other and knew this was it. It just felt right. We will be moving in May. We have lived in this house for 53 years. We have raised our children and grandchildren in this house. This house has been filled with the laughter and tears of a lifetime. So many memories! And all those memories will be coming with us. We are extremely excited to see what adventure lie ahead for us. I love my aqua yoga class. Life has been stressful lately and this class helps the chatter in my head slow down and I feel a bit of peace. The warm water surrounds me and holds me up. I greet my fellow yogis and feel their friendship and love. The teacher smiles and we begin to breathe deeply and to sway and stretch in this this place that feels safe. I stretch and hold a pose. I concentrate on breathing in and out. I stand in tree pose and gaze out the window at the bare trees of winter. The sky is dark with clouds. The scene is gloomy. Then suddenly a ray of sunshine breaks through and I see a patch of blue sky. I am reminded that the sun is still there. Blue skies will return. The trees appear lifeless, but I know that spring will come and these trees will sprout new green leaves. Breathe in. Breathe out. Spring will come. Life will return. 25. Justin and Mikaela. It is good to have friends who will shovel the snow from our driveway. 26. Our heated mattress pad. I love crawling into our toasty warm bed. 27. The soothing tick-tock of the coo-coo clock. 28. My nieces Julie and Jeanne who are helping Bill. 29. Clothes warm from the dryer. 30. The sound of the snow plow clearing our street. 31. Chatting with my son on the telephone. 36. Blueberry pie with my brother. 37. Flowers that make me feel loved. 38. The Js loving Bill. 39. Bill’s little church family. 40. Laughter with my family. 42. Lexie and Mik’s apartment. A safe place to relax. 43. Finding a parking spot in California. 44. Memories of growing up with love. 45. Flowers on mom and dad’s graves. 46. Home sweet home after a long, emotional journey. 48. Family dinner with Ashley and Daiquan. That nice, warm, family feeling. 49. Faith. In life and in death I belong to God. 50. Warm chocolate chip cookies. 52. Sharing dinner with friends. 53. A good car heater. How do I describe the love I feel for these two people. Words are just inadequate. Dennis is my rock, my safe refuge, my lover, my best friend. I cannot imagine a life without him. I yell at him and fuss at him and get madder at him than any other person in the world because I know he will love me anyway. It is safe to share my frustrations and anger with him. He has to be the most patient person God ever created. I am eternally grateful to be the wife of this good man. Ann is my flower child. She fills my life with wonder and joy. Since she was born she has been full of questions of why, questions I could not always answer. She has made me think and ponder about things I never even thought to question. She inspires me. She has a gift with words and tells wonderful stories. Ann blesses this world and makes it a better place. I am really not a very big football fan. I do cheer for my Washington Redskins, but being a Redskins fan tends to temper my enthusiasm for the game. I despise the NFL. The league is a big, greedy corporation with no concern for the players. But there is something wonderful about football. Love for football seems to unite all sorts of people who otherwise would never speak to each other. Getting caught up in the excitement of a big game is just fun. Today the Denver Broncos beat the New England Patriots. I know my son-in-law and others are disappointed but I am glad they won. Gramma Kay would be so happy. My in-laws were huge Broncos fans. They loved watching and rarely missed a game. One Sunday afternoon in 1986 they returned from church and had just settled into their chairs to cheer for their team. Life was good. The game began when Kay turned to Bill. He had slumped over. She jumped up to help, but he was gone. She called 911. The ambulance came and took him to the ER. Her son raced to the hospital. Bill’s heart just quit. It was so sudden and so unexpected. It was so hard to believe. We were all stunned. Riding home from the hospital she suddenly remembered the game. She asked “Did the Broncos win?” On the worst day of her life football gave her something to smile about. I am always happy when the Broncos win because it would make Kay so happy. Making a list of 1000 things for which I am thankful for is harder than I had expected it to be. I am sad about the death of my sister-in-law, but grateful for the years she lived. We survived a blizzard with no problem. Life is indeed good. I have been adding to my list of thanksgivings, but to reach 1000 I will have to learn to be more observant. Here is the continuation of the list. Grief brings tears. Tears are the price of love. Love is worth crying about. It is so good to have a daughter-in-law who loves my son, my grandchildren and me. I love being able hear the voices of people I love who are far away. It is very cold outside. I like being warm. 14. Daughters who check on me to make sure I’m OK.
15. Old pictures that make me smile. 16. Looking out the window at new fallen snow. Everything looks so clean. 18. Stories that take me to wonderful places. I am so glad that I can read. 19. A good report from the doctor. It seems that I really do have a good heart. 20. Sunlight glistening on long icicles. 21. Being buried in a warm, happy place during a blizzard. 23. The aroma of a big pot of chili on a snowy day. 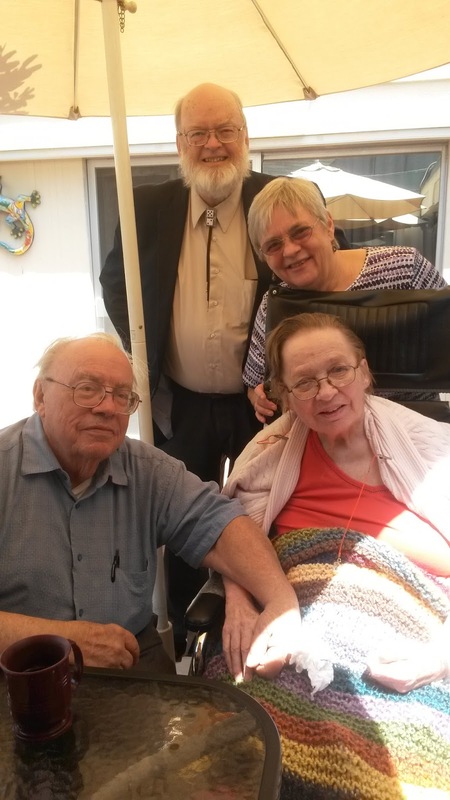 My sister-in-law Jean died yesterday. 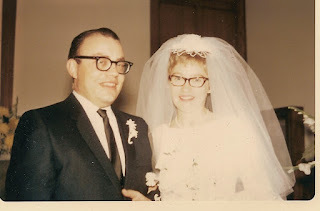 She and my brother Bill were married for 47 years. They went through all the joys and sorrows of life together and were the center of one another’s worlds. I am thankful for the years they shared. Jean fell seven years ago and suffered a severe head injury. She never fully recovered from that injury and she has spent her life since then in a nursing home. Bill has spent each day by her side. There was nowhere else he wanted to be more than with her. They were the center of one another’s world. The picture above is on their wedding day. The picture below was taken on our last visit with them in May.